Did Michele Bachmann Mediation LLC ever exist? Since Michele Bachmann announced her candidacy for president, national and international media have been rummaging through the Dumpster of her life for whatever details about her past they can uncover among the refuse. Much of what is known about her professional and political career has become a staple of her biography: Graduated from Anoka High School in 1974, graduated from Winona State University in 1978, graduated from Oral Roberts University in 1986, got a tax law degree in 1988 from William and Mary School of Law, worked for the IRS from 1988-1993, got elected to the Minnesota State Senate in 2000, and elected to Congress in 2006. 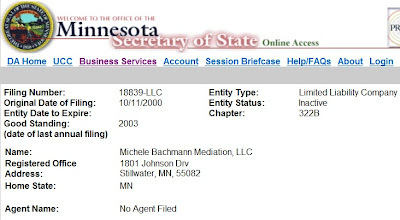 But those seven years between the IRS and State Senate seem to be missing a few pages—particularly anything about "Michele Bachmann Mediation LLC," a business that even Bachmann is uncharacteristically silent on. 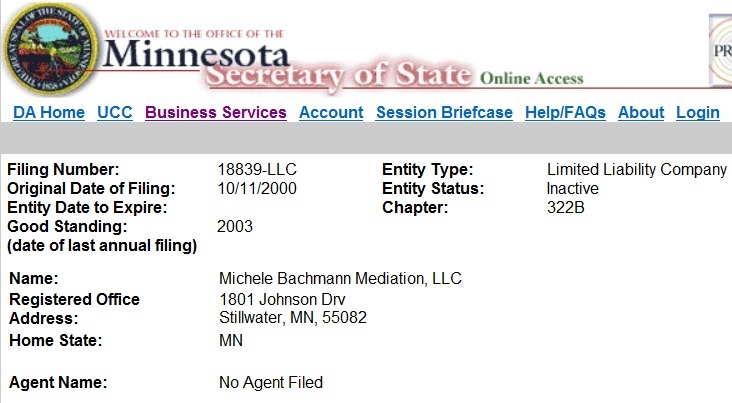 A business listing for Michele Bachmann Mediation LLC on manta.com describes it as a “Communication Services, NEC” company with an SIC code of 4899. Dun & Bradstreet also listed Michele Bachmann Mediation LLC under “communication services.” Other companies similarly listed with the SEC include satellite and wireless telecommunications companies, not mediation services. Estimated annual revenue of the LLC, according to the manta.com listing, was $67,000. Bachmann’s old home address in Stillwater is listed as the business address. Bachmann sponsored an “Adopt-a-Highway” stretch of Stonebridge Trail in Washington County under the auspices of “Michele Bachmann Mediation LLC” from 1995 until October 2001, when she requested that Washington County change the name of her Adopt-a-Highway signs to “State Senator Michele Bachmann.” (The signs later had to be changed again to read simply “Michele Bachmann” when it was discovered that the use of her political title was not allowed under county rules.) She used her home address on her Adopt-a-Highway application as well, according to the Washington County Transportation Department. 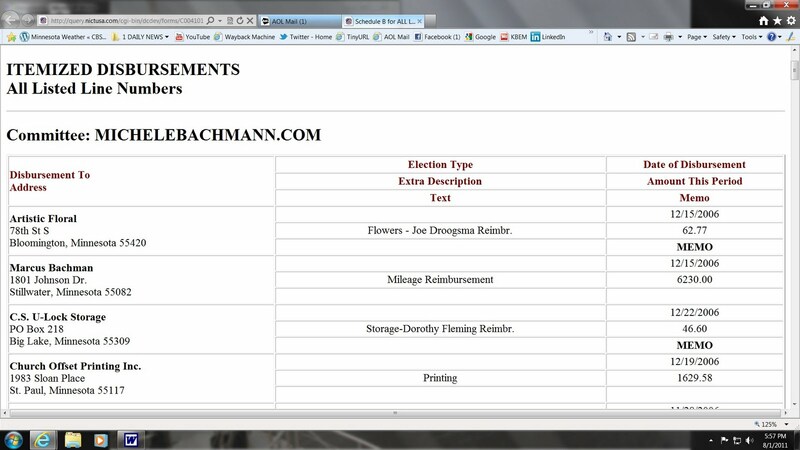 Bachmann’s political websites simply gloss over the missing seven years between the IRS and the State Senate. 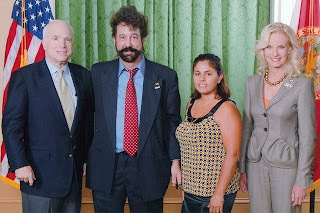 “Prior to serving in the U.S. Congress, Michele was elected to the Minnesota State Senate in 2000 where she championed the Taxpayers Bill of Rights. Before that, she spent five years as a federal tax litigation attorney, working on hundreds of civil and criminal cases,” her campaign website states. “Prior to serving in the U.S. Congress, Bachmann served in the Minnesota State Senate from 2000-2006. As a Minnesota State Senator, she championed the Taxpayers Bill of Rights. Before holding elected office, Bachmann worked on hundreds of civil and criminal cases as a federal tax litigation attorney,” her congressional website states. 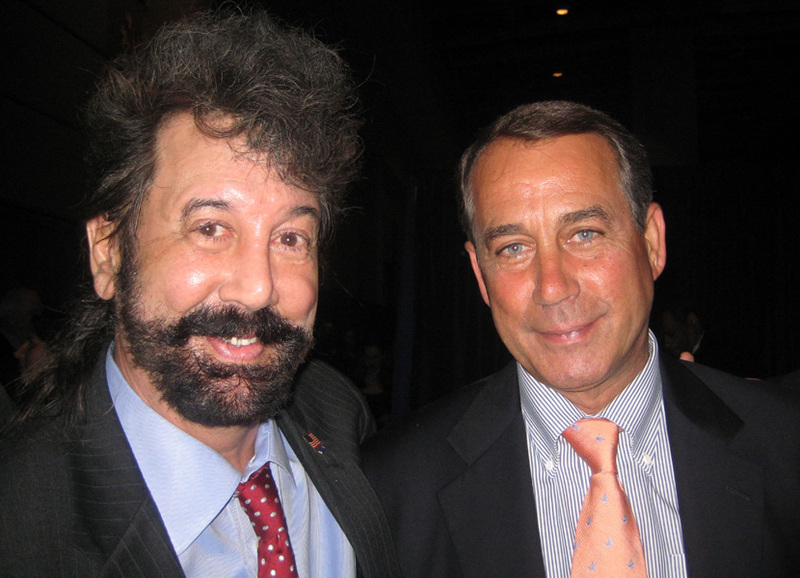 Bachmann never fails to mention her and her husband’s Christian counseling clinic wherever she goes. And she's bragged about virtually every other job she claims she's held, from bus driver to fish cleaner. Yet she’s never spoken publicly about her alleged mediation business. Despite the avalanche of news stories about Bachmann in recent months, including a 9,000-word opus in the New Yorker magazine, you won’t find a word about Michele Bachmann Mediation LLC in any of them. There’s nothing in public court records to be found about Michele Bachmann Mediation LLC either, and nothing turns up in searches anywhere else. So what gives? Bachmann has already tried to claim her family’s pray-away-the-gay clinic is off-limits to reporters (unless she brings it up). Maybe she’d rather answer some questions about her other alleged business instead. If, in fact, it ever existed at all. Is Bigfoot on the prowl in Washington County? Out here in rural Washington County, wildlife is abundant. I shoot all the deer I need within 100 yards of my back door. Wild turkey are as common as crows. Black bear are regularly spotted in the township, and even the occasional cougar. But last month may be the first alleged sighting of Sasquatch in Washington County, and Ripple in Stillwater has learned that it occurred about 5 miles or less from our world headquarters here in Stillwater Township. On July 6, a farmer and his wife were walking through the woods next to their hayfield north of Stillwater when they heard a low grunting sound. The farmer whipped out his new iPhone and shot about 5 seconds of video of something running through the woods. It wasn’t until he looked at it a few days later that he realized that it may not have been a deer after all. An internet denizen who goes by the name of "SasquatchWatcher" posted the video to youtube, with his own annotations. 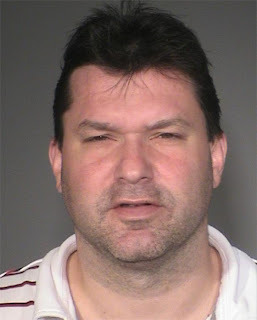 He described the alleged Bigfoot creature in the video as an “Auburn Sasquatch,” a reference to its hair color, and left no doubt as to his opinion of the video’s authenticity. 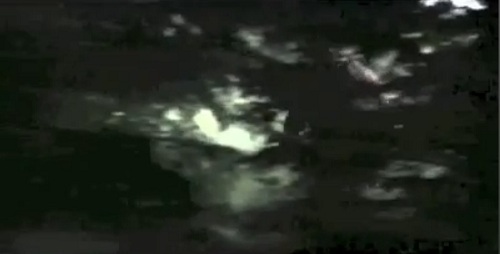 The narrator describes various markings and movements of the figure in the video—“all over Auburn hair, high shoulders, gray hands, pigmentation line on hand, muscles move when right foot stomps”—and notes that they match other Sasquatch sightings on record. The video notes that "The filmer answered a few questions, realized this was serious and wisely chose not to pursue it." Ripple in Stillwater has its own theories about what our nearby farmer may have captured on video. What do you think? Was spouse's 'driving-around money' legitimate? Based on the federal mileage reimbursement rate of 44.5 cents/mile at the time, that payment represents exactly 14,000 miles. That’s a lot of miles that Marcus put on for Michele's campaign in 34 days—418 miles a day to be exact—especially considering Marcus claims he drove them a month after the 2006 election was over. It would be interesting to see Marcus’ mileage logs from that busy month on the road. Was this refund from Marcus Bachmann an admission that the “mileage reimbursement” was erroneously paid to him and if so, what prompted it? 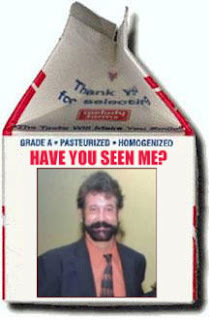 Ripple in Stillwater has asked Bachmann’s campaign for an explanation of Marcus' mileage mystery. Maybe the FEC should too. The additional $300 shown in the aggregate total for Marcus Bachmann's campaign "donations" is most likely for this receipt of a donation from Marcus Bachman (sic) to Michele's campaign: $300 for "personal use of vehicle" dated Dec. 11, 2006. Also, the mileage rate for 2006 was 44.5 cents per mile, not 48.5 cents per mile as originally reported. The rate changed on Jan. 1, 2007 to 48.5 cents. The figures above have been adjusted accordingly. 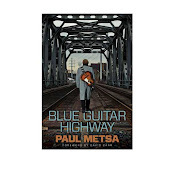 H/t to City Pages for spotting this. 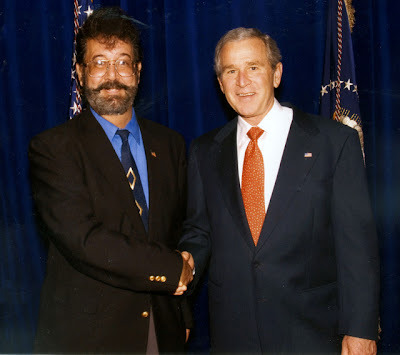 Is presidential candidate being deliberately deceitful by using bogus address with state, FEC? 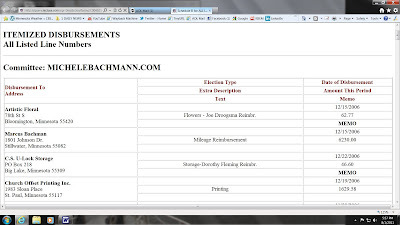 It may take a complaint filed with the FEC to determine what address was listed on the receipt, invoice or check that Bachmann provided her campaign for her reimbursement. The FEC frowns on candidates filing false information, and it looks especially bad when the information is the candidate’s own address on a reimbursement receipt. It’s not likely the current owners of Bachmann’s old house would be happy to find out that she’s been using their address on her legal filings, either, because this isn’t the first time. It's also not the first time Bachmann's mileage reimbursements have been questioned. 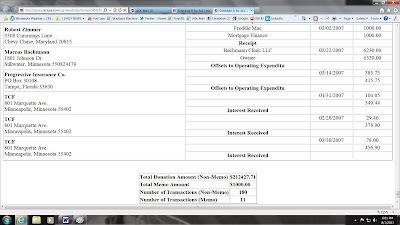 DumpBachmann.com noted a suspicious FEC receipt for $6,230 in "mileage reimbursement" to Marcus Bachmann, Michele's husband, back in 2007.